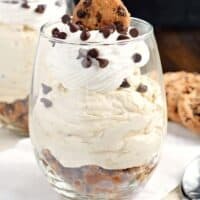 Fill a glass with this beautiful NO BAKE Chocolate Chip Cookie Cheesecake Parfait! Layer after layer, it’s a delicious dessert recipe any time of year! Easy desserts are my jam. I mean sure, I love baking a decadent, over the top cake from time to time. But most nights? We go the easy route. Cookies. Krispie Treats. Ice Cream Cakes. And sometimes, I remember to plan ahead and whip up a no bake cheesecake parfait! This is the perfect recipe to hang on to for summer. If you’re like me, you probably avoid turning on the oven as much as possible. The first layer is crushed chocolate chip cookies. I used Chips Ahoy, but feel free to use whatever you want for this. I kept my “crust” a little chunky, not a fine powder. Add in some melted butter and blend with a fork. This is your first layer. Layer two is all about the cheesecake. Start with your softened cream cheese and beat in some brown sugar. Scrape down the sides of the bowl a few times, and let this whip up smooth for about 3-4 minutes. You want it creamy! You’ll add your vanilla, Cool Whip, and mini chocolate chips and then put this over the crust layer. Finally, your garnish. I used Cool Whip, more chocolate chips and a cookie. Use a pretty glass or small mason jar to make it look impressive! Even wine glasses would be very pretty! 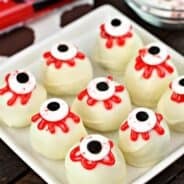 I made mine into 4 large parfaits, but to spread the love around, you could make them smaller into 6 parfaits (perfect if using wine glasses or juice jars). Refrigerate for at least an hour to chill the cheesecake. I usually make this in the morning and we enjoy it after dinner! So good! 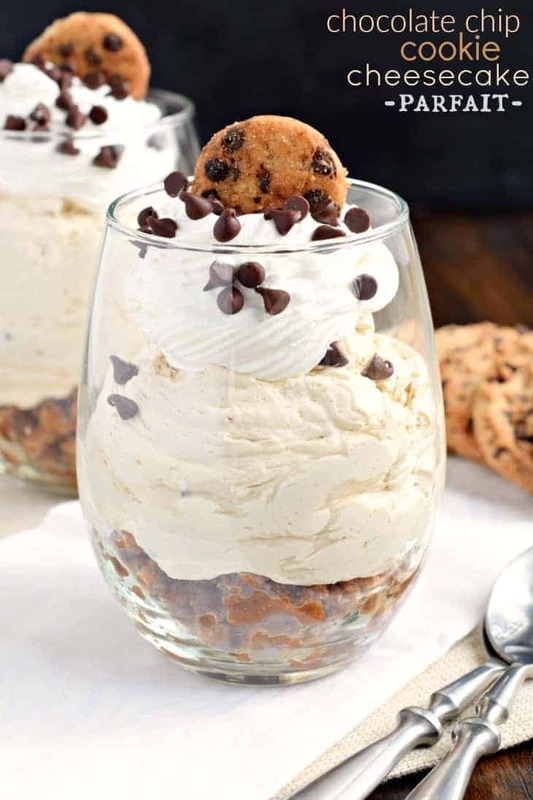 Fill a glass with this beautiful NO BAKE Chocolate Chip Cookie Cheesecake Parfait! Layer after layer, it's a delicious dessert recipe any time of year! In a mixing bowl, combine cream cheese with brown sugar. Beat on high speed for about 3-4 minutes, scraping down the sides of the bowl several times. Make sure there are NO lumps. Add in vanilla extract. 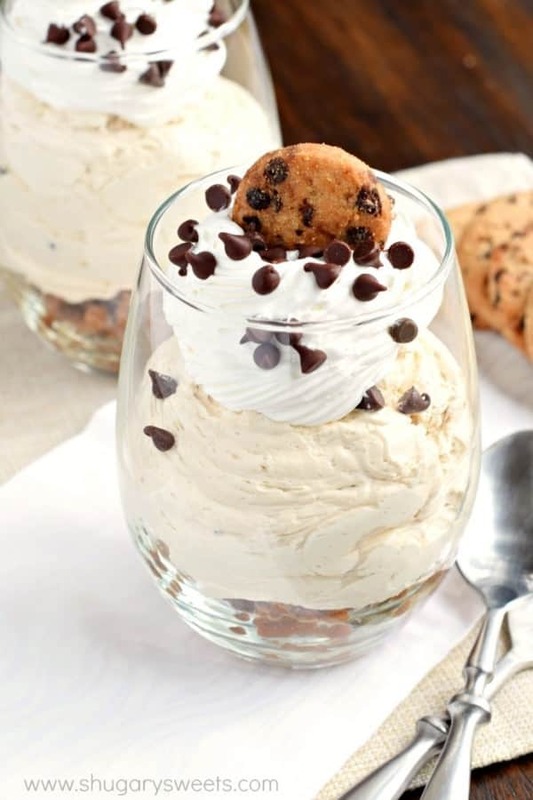 Fold in 8 oz of the Cool Whip and 1/4 cup mini chocolate chips using a wooden spoon. Spoon over crust in jars. Top with remaining Cool Whip and mini chocolate chips. Top with a small chocolate chip cookie (or break a whole one into fourths). 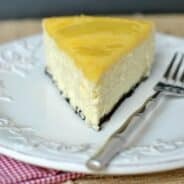 Refrigerate for at least an hour, giving the cheesecake filling time to chill. ENJOY. Easy is definitely the best. Especially when cheesecake and chocolate chip layers are involved. You can’t get better than that! 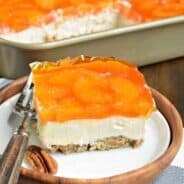 Easy and decadent! What a great combination! I need this so bad. I can’t get over how satisfying and sweet and perfect these parfaits look! Love how easy these parfaits are! They sound so good! This recipe looks absolutely amazing! Totally loving how easy it is to make!! 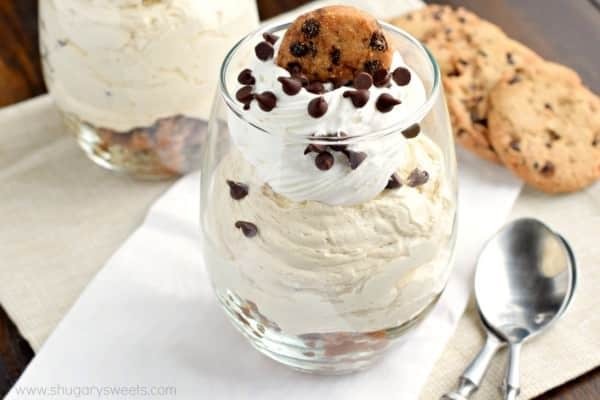 Oh my god… that looks amazing!, I am OBSESSED with anything with cookie in! I am definitely going to try this! I just know this will be amazing, once again thanks for sharing such an amazing recipe! These look amazing! I love parfaits, so rich and so light at the same time!